I wanted to post some pictures of the oldest area of Stuttgart! Very close winding streets, with trees trying to bud out into spring, but it is a bit early yet here. After teaching yesterday at Nadel und Faden, we walked through the area to look at the old buildings! There are also sculptures and carvings and I wish I had more time to take it all in! 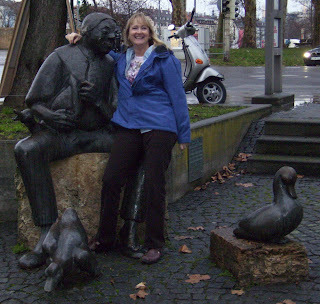 Here I am sitting on a statue in the corner of a little square. The public areas are also dotted with really interesting water fountains that are old and still functional…clean drinking water! I hope you will enjoy flipping through the slide show. It was built in 1463!!! 1463!!! Just pinch me…isn’t this WONDERFUL!? Here is the rest of the photos….I enjoyed this trip so much! There may be some duplicates in here….It posted before I could remember to remove what I wanted to remove…it’s late here and I have to leave for the airport at 4:30am so I’m kind of in a hurry to post this. This is my sweet friend Aby standing next to the Old gate of the city! Crazy woman, it’s freezing out, and here she is in a skirt and pantyhose! Those who live here are a tough breed, that’s for sure! I’ve really loved spending the time with Aby…..we’ve spent the last 2 evenings sewing and chatting and singing to whatever was on the CD player! She always has a smile on her face and can be found whistling a tune at any given moment. I’ll miss her! Valerie came from Paris with another friend Caroline from the states! Brigitte came and stayed for 3 workshops and a lecture, and we enjoyed a dinner out just the three of us chatting and talking. Brigitte and I figured out we have known each other since the beginning of the Dear Jane Explosion, probably about 11 years...this was the first time we met in person but it felt like I've known her forever. I'm sure I've left some out...not intentionally, and I'll remember things and write more about them as I gather my thoughts. Tomorrow my flight goes from Stuttgart to Heathrow in England! I wish I could get off the plane and do some visiting….I’ll be waving to my friend Karol Ann even though she is hours and hours away up in Yorkshire, at least I am in the same country! It was fun meeting her in person this week too. I fly from Heathrow to Chicago, and finally from Chicago to Greensboro, getting in at hopefully 5:30pm with NO DELAYS! Some of the quilters said it was too bad I didn’t have more time to sight see….but I tell you what, the friendships I’ve made and strengthened while I’ve been here mean MORE to me than any touristy thing I could have done. I loved seeing what real life is like here and spending my time with these amazing women! And I’m definitely coming back! Count on it! Wednesday? I’m taking a well deserved JAMMIE DAY! Well except for late afternoon when I’ll be a guest on Mark Lipinski’s Creative Mojo radio show! Stay tuned for more details on that…you don’t mind if I do a phone interview in my jammies, do ya? Quipped by Bonnie K. Hunter at 5:33 PM 16 Snips & Comments by others! Free Kindle/Nook Book & Star Struck Workshop! I just downloaded this for my trip home from Germany on Tuesday.... I don’t know how long it will be free so you might want to hurry and get this one! 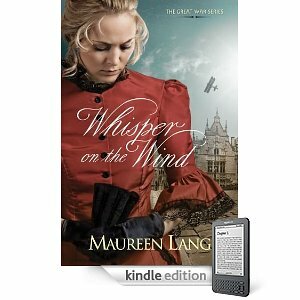 Whisper on the Wind, by Maureen Lang, is free courtesy of , from both Amazon and B&N. Click HERE for the free download from B&N. I think I’m going to have to skip around and not do these workshop posts chronologically…..I think it would be easier if I just dug in and showed you where I was today as a place to start! 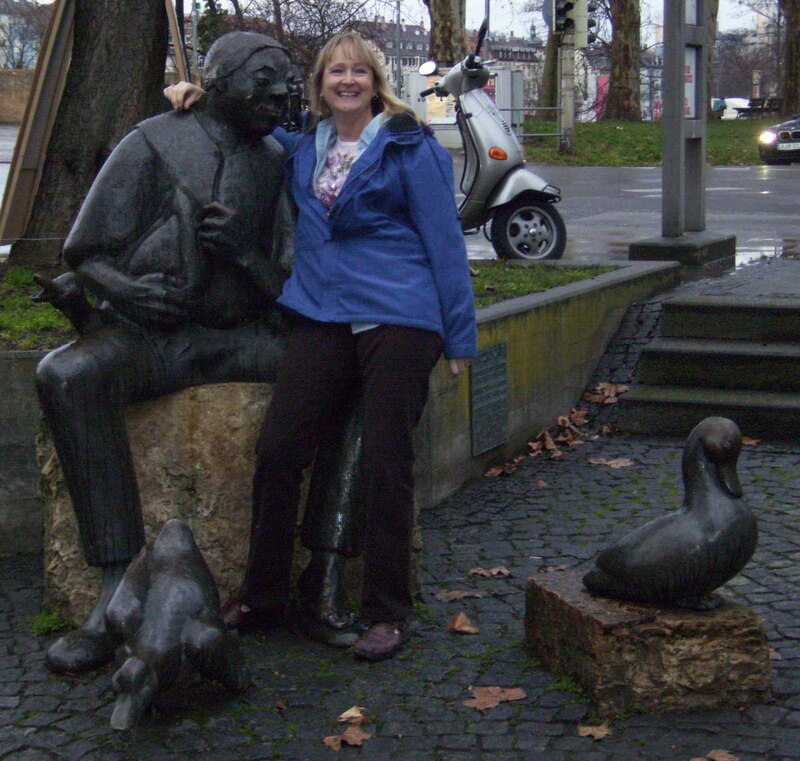 Here I am with Uschi, who owns “Nadel und Faden” in the oldest section of Stuttgart! Today was our Star Struck workshop, and I was just in awe at the wonderful buildings down this street! See that round window behind us? The building was in use in the 1700s (maybe earlier) and it was originally a vinegar distillery! the round window was a doorway/gate, and the horse pulled wagons would pull in through this opening to load/unload their wares. There is an identical archway at the back of the building that mirrors the one on the front so they could go in one end and out the other. Isn’t it fabulous? And here is Uschi and Elke doing their best to pin up my quilts on the walls! Quilter’s gymnastics, right? She had very tall walls and we were able to pin up both display quilts, and drape the extras over the banisters…. Never let it be said that Quilters go hungry in Germany! Elke also made this scrumptious cheese cake! Doesn’t it look great? It didn’t take us long to go to THIS! I don’t think there was even much left to take home by the end of the day, it was so good! What I really love about the food here is it is not OVERLY sweet. In the USA…things are sweetened so much that you can’t taste the other ingredients. And that goes for EVERYTHING from cake to cookies to chocolate to even juices. Remove some of that fake sweetness, and you have so much more FLAVOR! Nut Bread! YUM!! There is a glaze on this, but not too much, and the inside was loaded with cinnamon and nuts….so VERY tasty! We were also very lucky to have Birgit Kaller of Patchwork Gilde with us today! We were working on an article for a September issue, so be looking for it, those of you in Europe who can get this Magazine! There are MORE photos of the old area of Stuttgart, I just have to take the time to edit them all down, so that might be what happens during airport layovers on my long journey home…. Tomorrow is my last workshop with the Black Forest Quilters….it’s the Love Shack workshop, and we are going to have a lot of improvisational Crumb-Fun! ALSO! Barb posted a really sweet post about my visit to Texas! The crazy woman even posted me on youtube! I honestly never thought I talked so FAST!! Must work on that.. :cD Anyway, go give her a peek and tell her I said hello and THANKS for the great shout out! Quipped by Bonnie K. Hunter at 7:13 PM 19 Snips & Comments by others! A little bit of spring! It’s a Quilt Fiesta Give-Away! So many picutres, so little time! Virginia Bound Workshop in Denton, TX! Oklahoma Backroads with Trinity Valley! Bear Creek Quilt Guild Fun! Scrappy Mountains in the Blue Ridge! Straight Set Sashing & Cornerstone Chart! Free Kindle/Nook E Book, and a Quilt Update! Scraps & Shirttails II Trunkshow! Drawing A Winner --- It’s Half Time!